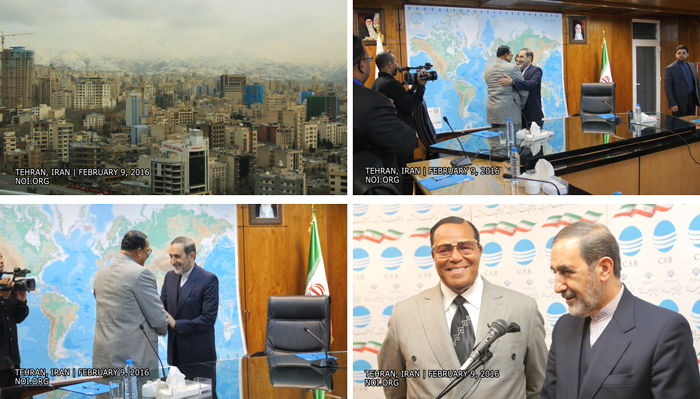 Minister Louis Farrakhan calls for Muslim unity during a Feb. 9, 2016 Iran Press Conference at PressTV's studio in Tehran, the capitol of the Islamic Republic of Iran. Every nation on earth contains dissatisfied elements and the U.S. wants to use those dissatisfied elements to foment revolt in Iran, the Minister said. Positive dissatisfaction can help Iranians evolve the revolution and move society forward, he explained. But secret councils to promote sin and revolt are forbidden in the Qur’an and America wants to support those who are unhappy to destroy Islamic nations, Min. Farrakhan continued. He called for Iran to listen to young people, in particular, though they may seem different. Offer guidance and counseling so that youth will never join those who wish to destroy the revolution, urged Min. Farrakhan. Youth are the future and should be utilized to keep evolving the revolution and moving Iran forward, he said. Sects and parties must never be put above the religion of Islam, the Minister said. The Qur’an warns against dividing up the religion due to envy and glorifying in a part of Allah’s message, he said. While Muslims in America have had differences, there was never bloodshed between the Nation of Islam, led by Min. Farrakhan, and the Islamic community led by the late Imam W.D. Muhammad. We are an example for the Muslim World, the Minister said. The Sunni-Shia schism goes back to a conflict over who would succeed Prophet Muhammad at his death, which resulted in the killing of his cousin and son-in-law Ali and Ali’s sons Hassan and Hussein. Iranian Muslims believe Ali was the rightful successor to the mantle of Prophet Muhammad some 1,400 years ago. “America is busy feeding that divide with toxic language to make us fight and kill each another,” the Minister said. Growing up under tyranny in the West, where Blacks were stripped of their names, history, culture and religion, it is easy to see America’s deception at work, he added.